Offering a 250 kg lifting force at the push of a button, the need for manual pumping is eliminated, providing a safe, clean, powered lift that is quiet and ideal when hydraulics can't be used. The trolley uses a linear actuator (rated IP54) as the lifting mechanism, and a specially developed battery box that powers up to 150 lifts per charge. This eliminates hydraulic fluids or oils and provides a quiet, steady lift force. A high duty cycle, rechargeable battery supplies the power and a push button controller makes operating the Powerlift trolleys effortless to use. 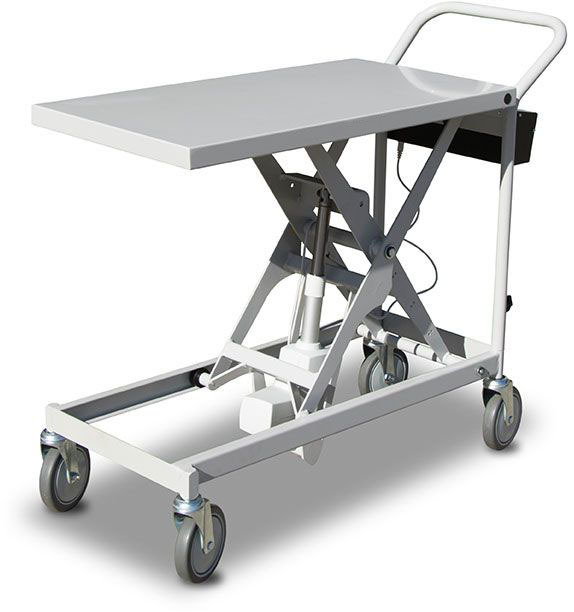 Large diametre, low friction, non-marking grey polyurethane castors make the SLB250 trolley easy to move, highly manouverable and ideal for office or factory use. The SLB250 is very safe to use but as with all scissor mechanisms, care must be taken to avoid any entrapment as it is operated.